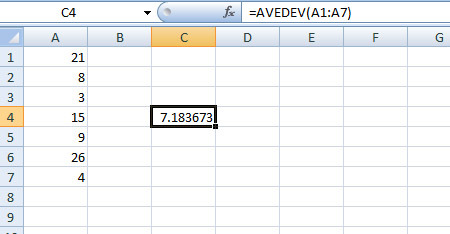 In Excel you can calculate 'standard deviation' and 'mean absolute deviation' of your data points or samples, so to say, with STDEVA function and AVEDEV function. But before we proceed, let's make it clear what are these two deviations. The terms make you little bit confused. So let's get it clear first. Standard deviation is a measure of how widely your data points are dispersed or far away from the mean (from the average value). A low standard deviation means that the data points are close to the mean, while a high standard deviation indicates that the data points are spread apart (over a wider range) from the mean. Microsoft Excels's STDEVA function estimates standard deviation based on a sample. calculates the mean or average value of the deviation. Now calculate absolute deviation of each data point from the mean. Remember, it's absolute deviation, so you ignore the minus sign.